Today Ty and I will be at the Huntsmen Cancer Institute. I have absolutely NO IDEA what they will advise us to do. Ty and I talk and I know that he must follow his own heart in his treatment. I have been praying for his heart to feel comfort. I have told him that only HE knows what is best for him. Right now, he is enduring the graft vs host issues. These issues in combination with the recent news can drive you crazy as to knowing what is normal and what is not. The main thing is FOCUS on the MAIN thing. That is Tyler and this is what keeps me going. I know often in life we want to know WHY? WHY is this happening in our life...? I met with my church bishop last night. He is just a wise and special man of God. We discussed how we will all have trials and some are horrible beyond horrible. He himself has lost a son. We will never know WHY the bad things happen. It is our faith that we don't become bitter or angry. We just know that we have to cherish every moment and day. We trust in God's plan and accept his will. So this morning, in meeting with the cancer specialists this leaves me with so many anxious emotions. This journey is not in our control. It never has been. I just told my bishop last night that there are times each day when I feel like I can't go on. Is this normal? I feel like I have been knocked down so many times in this cancer journey and with so many other life challenges. When I feel knocked down... humbled on my knees and struggling... I pray. I pray and pray and pray more. Then I remind myself to be strong, get back up like a WARRIOR. I can't and won't let these things make me bitter and I know I need to FIGHT with my husband. Trust me, it's easy to get depressed and not want to go on. I simply can't let negative thoughts get me down right now. My husband and children and business need me to keep positive and keep going. I find my positive outlook is one of the reason that my husband and family can look at each day with gratitude. I belief God is carrying us right now. One of the things I wanted to share with you today is a free project/workshop. This is my own personal book. It is one that I designed to tell my life story and who I am. This is with my collection- HELLO MY NAME is. I decided to share this with you today in hopes you too will take the time to document and tell your story. More than ever, I know how important this is. 8X10 GALLERY ART "LIFE IS GOOD"
THE MESSAGE. BY PARTNERING WITH JOANN I CAN HAVE MY PRODUCTS THROUGHOUT THE COUNTRY. DID YOU KNOW GIRLS ARE TAKING ROAD TRIPS ACROSS TWO STATES TO GO TO A JOANN? THIS HAS HUMBLED ME... 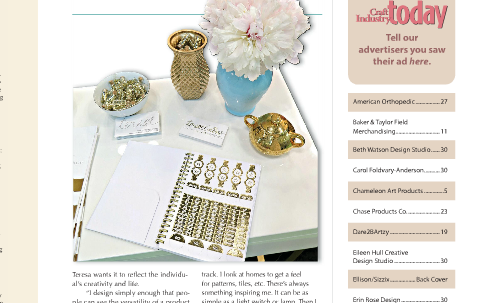 THIS IS WHY I DESIGN COLLECTIONS FROM THE HEART. THIS IS MY & TC FISKARS PUNCH. YES, IT IS THAT LARGE! ONLY YOU CAN TELL WHO YOU ARE. AND MY LIFE. NO ONE CAN TELL MY STORY LIKE I CAN. THESE PAPERS AND THIS COLLECTION WILL HELP YOU TO TELL THE STORY!!!!!! THIS IS MY SEAL TC FISKARS PUNCH WITH MY GEMS INSIDE THE SEAL SHAPE. DOCUMENT YOUR CHILDHOOD MEMORIES!!! THIS IS MY BABY PICTURE. THIS IS MY ONLY PHOTO. I WISH I HAD MORE PHOTOS. THIS IS WHY I PRINT OUT THOUSANDS OF PHOTOS. THIS IS SO IMPORTANT. I COULD NOT BE PROUDER TO WORK WITH CANON. I DO TAKE MY PHOTO AND PRINT WITH MY CANON CAMERA AND PRINTERS. EMBOSSED MANILA FILE FOLDER PAGE- TC CRAFTWELL CUT N BOSS MACHINE AND WORD COLLAGE PAGE. **** LOOK WHAT EMBOSSING DOES TO REGULAR MANILA FILE FOLDER. I AM SERIOUSLY IN LOVE WITH MY MACHINE! 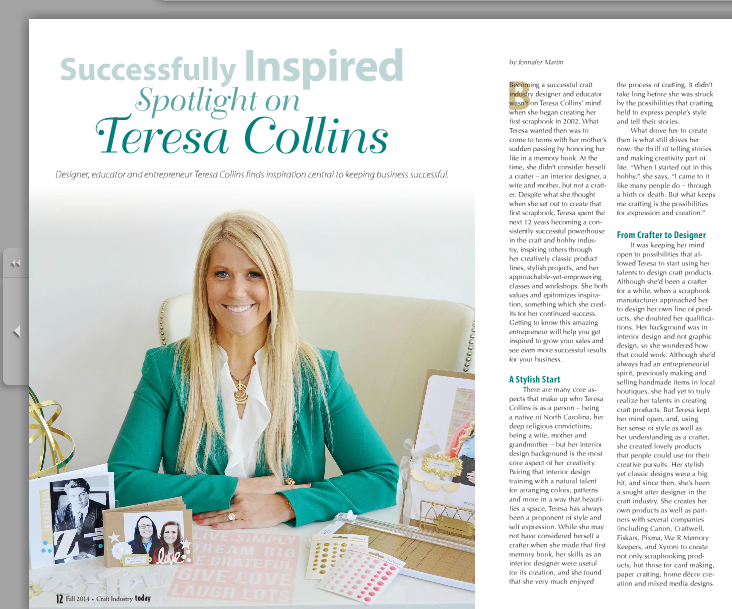 LIFE IS GOOD WITH HELLO MY NAME IS TERESA COLLINS COLLECTION IS FOCUSED ON HELPING TELL THE STORY OF YOUR LIFE. DOCUMENTING YOU AS ONLY YOU CAN DO!IF YOU DON'T TELL YOUR STORY... WHO WILL? ITEMS: TERESA COLLINS PAPER COLLECTION, TERESA COLLINS FISKAR PUNCHES (MINI STAR, &, LOVE, SEAL, ANCHOR, HEART, TAB, MINI HEART, GOLD TRIMMER), XYRON TERESA COLLINS ADHESIVES- MEGA RUNNER, CHIPBOARD PUNCH AND STAPLER. ALL ITEMS ARE CURRENTLY FOUND IN JOANN FABRIC AND CRAFTS. YOU MAY ALSO FIND THE PAPER COLLECTIONS AT YOUR LOCAL INDEPENDENT STORES AND ONLINE. ENJOY!!!!! 1. ADHERE LIFE IS GOOD 8X10 HELLO MY NAME IS ARTWORK TO CHIPBOARD WITH ADHESIVE RUNNER. 3. ADHERE SPRAY PAINTED GOLD BOOK PLATE TO LOWER RIGHT CORNER OF PHOTO WITH TC LIQUID ADHESIVE. ALLOW TO DRY COMPLETELY. 4. ADHERE STICKER FROM WORD TIDBITS JOURNALING (THROUGHOUT BOOK AS DESIRED BY RUNNING THROUGH TC STICKERMAKER). CUT OUT WORDS TO JOURNAL AS DESIRED. 5. INSIDE GOLD FRAME PLACE STICKER JOURNALING WORDS. PROJECT- THIS IS THE STORY; JUST BE YOU. 1. PAGE BASE IS FOUR TAGS CUT AS ONE PAGE FROM 12X12 PAPER. 2. PLACE ALPHABET INITIAL INSIDE CENTER OF TAG- HELLO MY NAME IS. WRITE NAME IF DESIRED WITH PEN. 3. 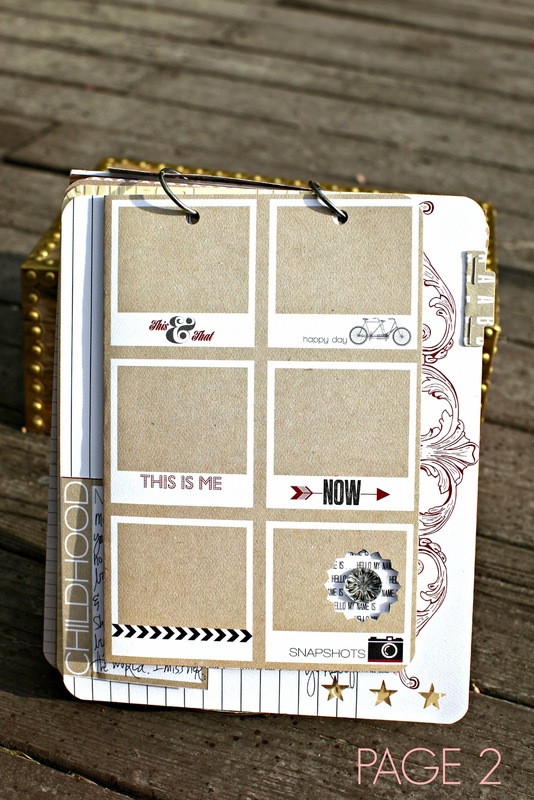 JOURNAL ABOUT YOURSELF IN SECOND TAG- THE ORIGINAL ME. PUNCH & FROM TC PUNCH WITH BLACK CARDSTOCK. STAPLE ALONG RIGHT SIDE CENTER OF TAG. 4. I AM>>>> 3X4 TAG. JOURNAL THINGS ABOUT WHO YOU ARE. 5. CORNER ROUND ALL CORNERS OF PAGE AS DESIRED. 1. 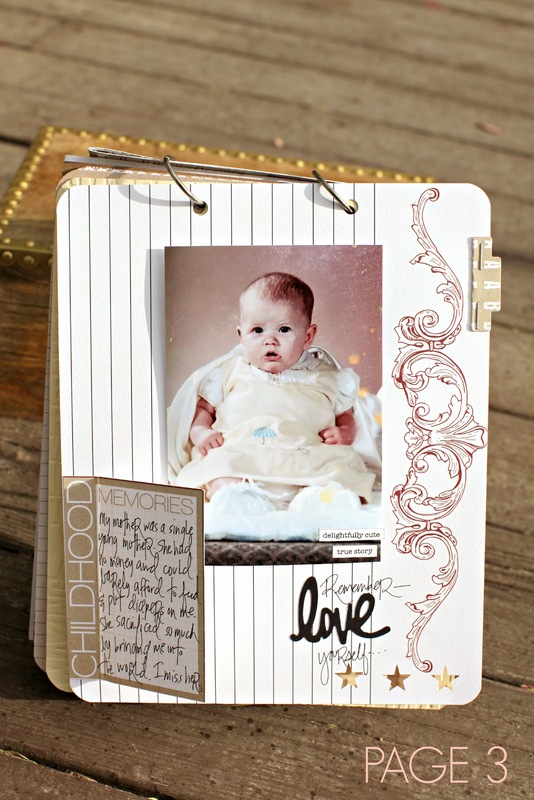 TAKE 12” WIDE PAPER WITH FRAMES AND SCORE IN ½ AND FOLD TO CREATE A POCKET PAGE. 2. PUNCH TC ZIG ZAG CIRCLE PUNCH TO THE LOWER RIGHT SIDE OF THE SNAPSHOTS FRAME. 3. FOLD THE PAPER IN ½ AND CREATE ENVELOPE BY AHDEREING ONLY ALONG TOP AND BOTTOM. THE RIGHT SIDE IS OPEN SO THAT PHOTOS AND OR LETTERS CAN BE PLACED INSIDE THE POCKET PAGE. 4. ADHERE CLEAR TC GEM TO THE CENTER OF THE PUNCH. 1. PAGE BASE IS RED SCROLL WITH BLACK LINED PAPER. 2. ADHERE YOUR “BABY” PHOTO IN THE CENTER OF THE PAGE WITH POP UP DOTS. 3. PUNCH TC TAB PUNCH FROM TAN ALPHABET 3X4 TAG PAPER. FOLD AND THEN STAPLE TAB TO TOP RIGHT PAGE EDGE. 4. 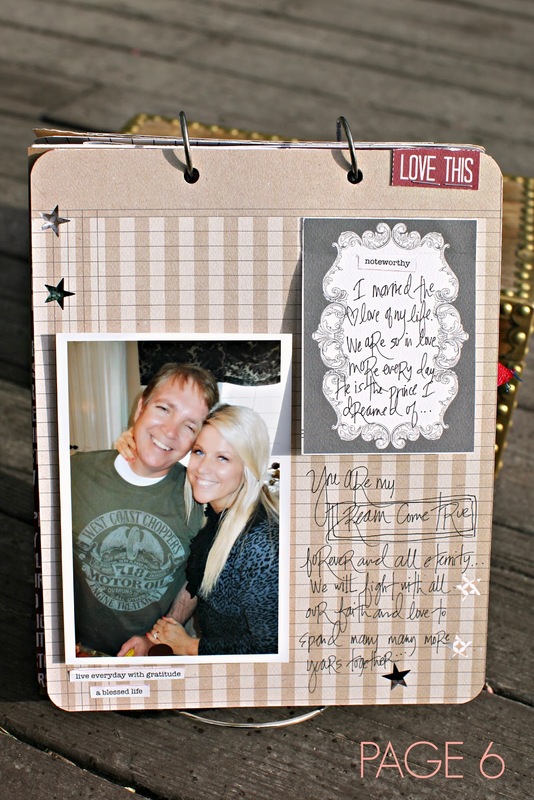 JOURNAL ALONG BOTTOM PAGE WITH BLACK PEN MIXED WITH LOVE TC PUNCHED OUT OF BLACK CARDSTOCK. PUNCH THREE TC STARS WITH PUNCH ALONG BOTTOM OF PAGE. 5. SCORE CHILDHOOD 3X4 TAG ALONG LEFT SIDE OF TAG. ADHERE ONLY CHILDHOOD PORTION OF TAG, TO THE LEFT LOWER BOTTOM OF PAGE. JOUNAL WITHIN BOX UNDER THE WORD MEMORIES OF YOUR CHILDHOOD MEMORIES. 1. PAGE BASE IS 8X10 EMBOSSED TC WORD EMBOSSING CRAFTWELL FOLDER. 2. PUNCH HEART TO THE LOWER RIGHT BOTTOM OF THE PAGE. 3. PLACE STICKER “HELLO MY NAME IS” ALONG RIGHT SIDE OF PAGE. WRITE IN YOUR NAME AND BIRTHDAY. 4. 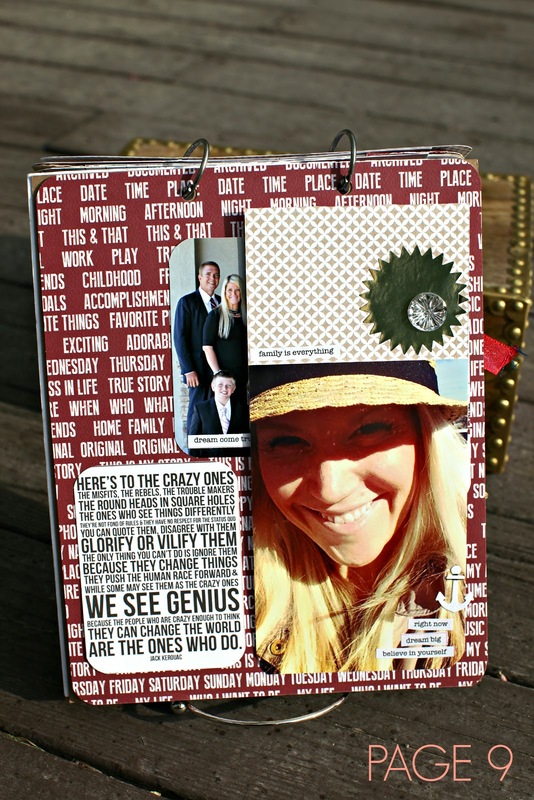 ADHERE 4X6 PHOTO TO THE CENTER OF THE PAGE WITH POP UP DOTS FOR ADDED DIMENSION. ALONG TOP RIGHT OF PHOTO ADHERE RED 3X4 TAG LABEL WORDS. (ORIGINAL). 5. PUNCH TC ZIG ZAG CIRLCE PUNCH THREE TIMES AND ADHERE TO PAGE WITH POP UP DOTS. ADD RED GEMS AND CLEAR GEMS TO THE CENTER OF THE PUNCHED CIRCLES. 1. PAGE BASE IS FOUR TAGS CUT AS ONE PAGE. 3. JOURNAL WITHIN THE HOUSE SHAPE. WRITE YOUR ADDRESS OR WHERE YOU ARE FROM. 4. LOWER RIGHT TAG- PLACE PHOTO INSIDE POLAROID FRAME WITH POP UP DOTS. 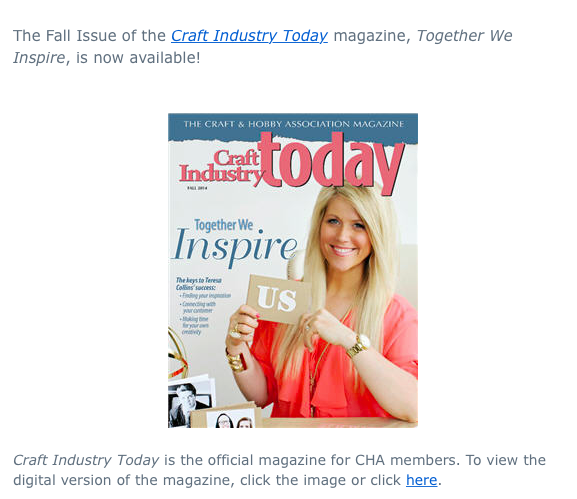 ADHERE JOURNALING TIDBIT- BEST DAY EVER. WRITE NAME WITHIN FRAME. 1. PAGE BASE IS KRAFT AND TAN LEDGER PAPER. 3. 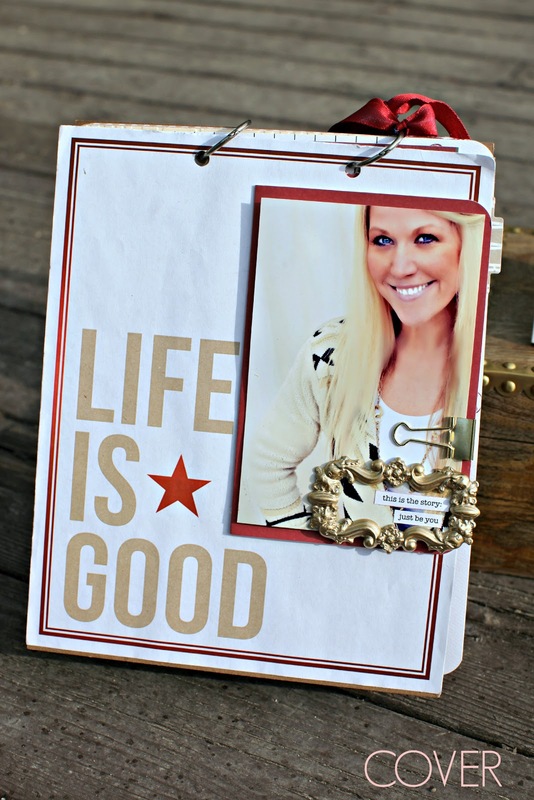 TAKE 3X4 BLACK ORNATE FRAME AND SCORE ALONG TOP SO THAT THE TAG CAN BE LIFTED UP FROM THE BOTTOM. ALONG TOP OF TAG ADHERE SNIPPETS CIRCLE- NOTEWORTHY. 4. JOURNAL ALONG BOTTOM OF THE RIGHT SIDE OF THE PAGE. 5. PUNCH FIVE TC STARS ALONG BOTTOM AND TOP OF THE PAGE. ADD THREE RED GEMS RANDOMLY AS DESIRED. 6. ADHERE PHOTO TO BOTTOM LEFT SECTION OF PAGE WITH POP UP DOTS. 7. 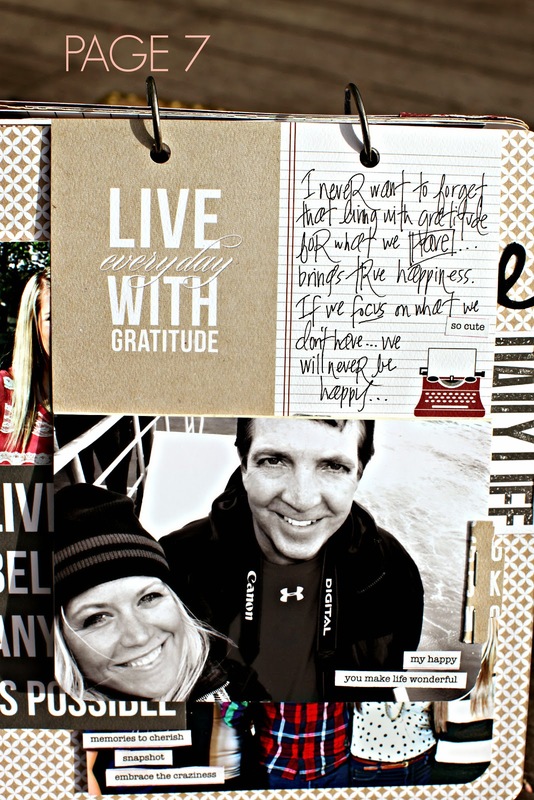 UNDER PHOTO, ADHERE JOURNALING WORDS: LIVE EVERYDAY WITH GRATITUDE/ A BLESSED LIFE. 2. JOURNAL WITHIN TAG- RED TYPEWRITER WITH PEN. 3. TAKE TC TAB PUNCH AND PUNCH WITH ALPHABET 3X4 TAG. 4. ADHERE PHOTO ON TOP OF THE TWO BOTTOM PAGE TAGS. ADHERE JOURNALING TIDBIT- MY HAPPY,YOU MAKE LIFE WONDERFUL. ADD RED GEM TO THE TAB PUNCH ALONG BOOK EDGE. 5. PLACE A THIN 2” X 6” PIECE OF PAPER TO THE BACK OF THE PHOTO ON THE FRONT PAGE SO THAT IT WILL LIFT UP AND . REVEAL THE TWO HIDDEN TAGS AS SHOWN IN CLASS. 1. PAGE BASE IS KRAFT WITH WHITE CIRCLE PAGE. 2. ADHERE TWO 4X6 PHOTOS TO THE PAGE WITH POP UP DOTS. 3. 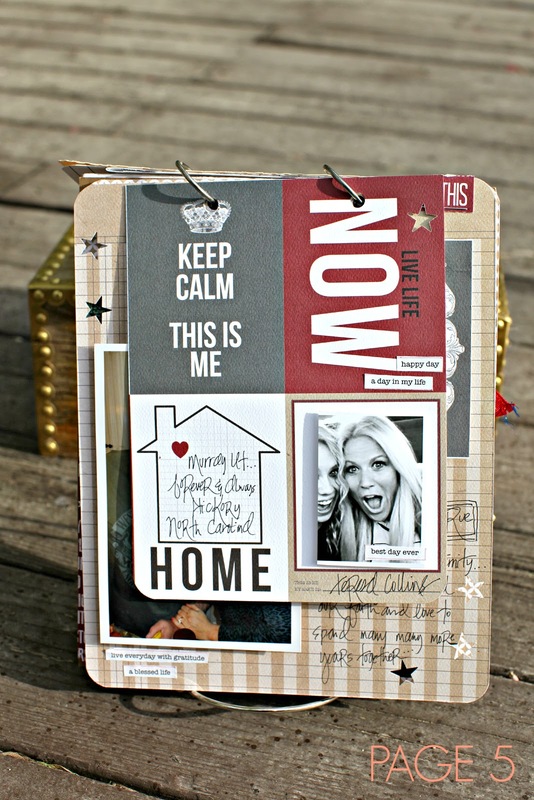 PLACE JOURNALING SNIPPETS IN PHOTO CORNER- FUNNY MOMENTS. ALONG BOTTOM PHOTO- MEMORIES TO CHERISH, SNAPSHOT, EMBRACE THE CRAZINESS. 4. 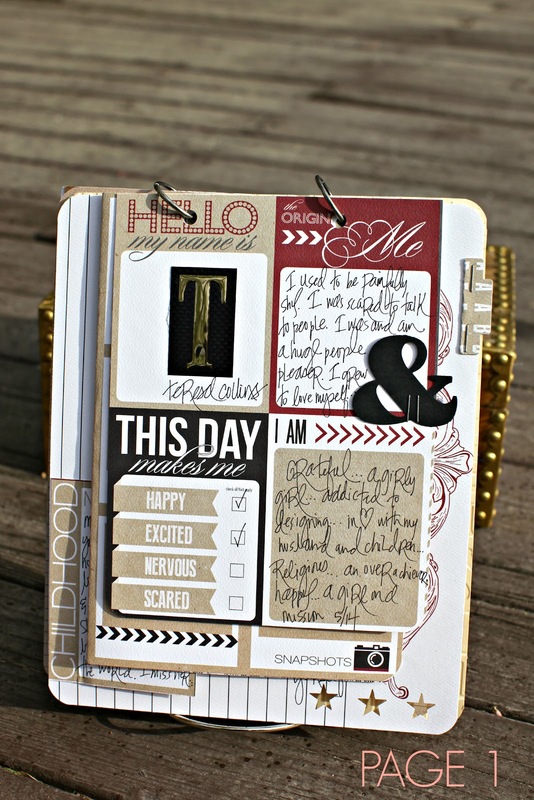 PUNCH TC LOVE FROM BLACK CARDSTOCK. ADHERE PHOTO ALONG TOP RIGHT. ADHERE LABEL WORD, FAMILY- RED MINI TAG PAPER AND TOP SECTION OF DAILY LIFE 3X4 CARD. 5. 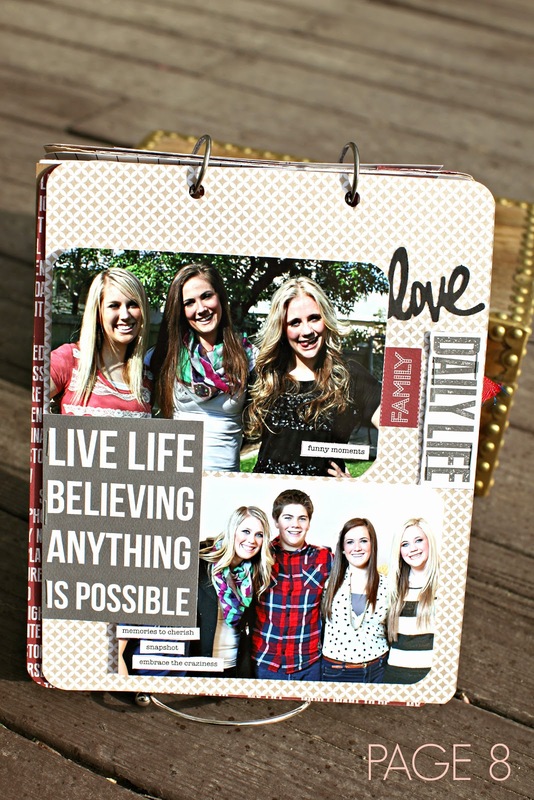 ALONG LOWER LEFT SIDE OF PAGE ADHERE 3X4 TAG- LIVE LIFE BELIEVING ANYTHING IS POSSIBLE. 1. PAGE BASE IS RED WITH WHITE WORDS PAPER. 2. ADHERE GOLD STICKER LABEL ALONG TOP LEFT OF PAGE. FOLD THE TAG PARTIALLY TO THE BACK SIDE OF THE PAGE. JOURNAL WITHIN TAG AS DESIRED. 3. TAKE TAN WITH WHITE CIRCLE PAPER SIZED 4X10 AND SCORE AT 4” FROM TOP TO CREATE A LIFT UP FLAP. CORNER ROUND ALL FOUR CORNERS OF PAGE WITH FISKARS PUNCH. ADHERE BACK OF FLAP TO THE RIGHT SIDE TOP OF PAGE. 4. ADHERE 4X6 PHOTO TO THE BOTTOM OF THE TOP FLAP SO THAT IT WILL LIFT UP. ALONG LOWER BOTTOM SECTION OF PHOTO ADHERE JOURNALING STICKERS: RIGHT NOW, DREAM BIG AND BELIEVE IN YOURSELF. PUNCH TC ANCHOR FISKARS PUNCH AND ADHERE IF DESIRED. 5. ADHERE GOLD STARBURST STICKER TO THE TOP RIGHT OF FLAP TOP. ADHERE CLEAR TC GEM TO THE GOLD STICKER LOWER BOTTOM. BACK COVER: PAGE BASE IS CHIPBOARD SIZED 8X10. 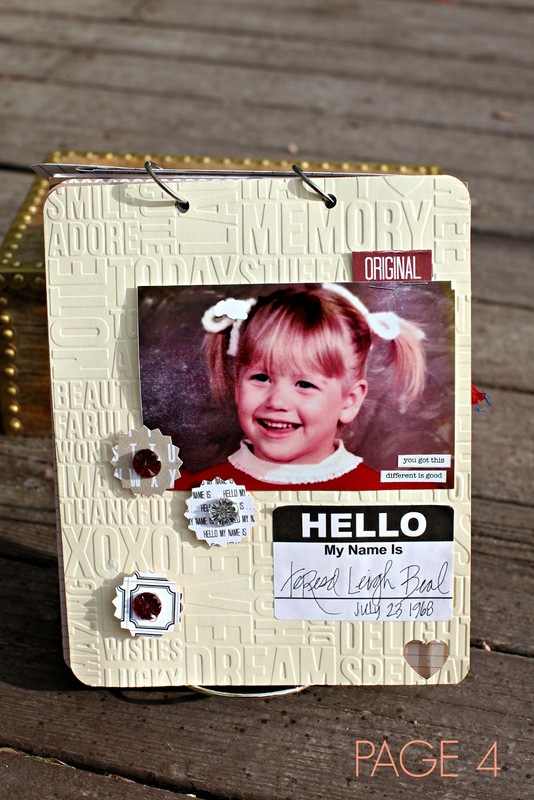 USE TC XYRON CHIPBOARD PUNCH AND PUNCH ALL PAGES IN THE CENTER ALONG EACH PAGE TOP. ADD METAL RINGS TO THE TOP TO KEEP THE PAGES TOGETHER. I am so honored... I had to share this. THANK YOU JENNAFER MARTIN FOR INTERVIEWING AND telling my story. I am in deep gratitude for your talent and for allowing my voice to be told. Sending you love and peace today! Thank you for the free project but also for the update on Ty. Continued prayers for him and also you to receive an extra measure of peace and strength while you go through this with him. Love from Tennessee. thank you for the workshop and for your continued sharing of your journey with Ty - you are one amazing woman. I found this while searching for something completely different. It's a post from a man on the American Cancer Society message board.It reminded me very much of your husband's situation. Thank you for the workshop! Hugs and prayers to you, Ty and your family. Never give up! God is in control. Sending you, your husband, and family lots of hugs. You all are in my thoughts. My favorite quote" You never know how STRONG you are until STRONG is the only choice you have". Wishing you strength and complete healing for Ty. Teresa, you are an amazing warrior. We will continue to pray for Ty and for the entire family. MONDAY in TAMPA... HSN time!!! !